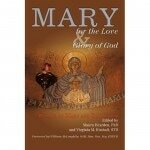 Mary for the Love and Glory of God, a publication of ESBVM USA, is collection of ecumenical essays by scholars representing various Christian denominations that were presented at the International Congress of the ESBVM in Pittsburgh, PA, USA, in 2008, has recently been published in the United States by ESBVM USA through AuthorHouse. The contributors to this book focus their attention on Mary, the Mother of Christ, the biblical disciple whose life brings us to the love and glory of God. Mary for Time & Eternity centres our attention at various points on the spectrum Mary Ecumenism: particular attention is given to the Blessed Virgins increasing importance in the various ecumenical dialogues such as ARCIC Anglicans with Roman Catholics, Roman Catholics with Lutherans and with Methodists, and the interdenominational Groupe des Dombes. Special attention is given to the prayed mariology of heart and mind as exemplified by both Orthodox and Catholic theologians, and is drawn also to Marys place, not always apparent, in Protestant thought as well as in non-Christian religions. There are essays on specific ecumenists especially in relation to Mary, and analyses of the way in which mariology has been approached, especially by the Ecumenical Society of the Blessed Virgin Mary itself. Mary for Earth and Heaven is a new collection of writings on Mary and Ecumenism, which, like its predecessor Mary is for Everyone, comprises papers from many different perspectives. It also includes selected homilies, delivered at Congresses and Conferences of ESBVM between 1997 and 2001. It is edited by William McLoughlin and Jill Pinnock (Gracewing, 2002) here to edit.